Introducing our most advanced toaster ever. Equipped with a host of smart features for effortless toasting, like our exclusive Keep Warm function, which automatically keeps toast warm even if you're not there. Self-centering racks help ensure consistent toasting of thin or thick breads, up to 3.8cm, while the LED lights indicate the toasting progress. The Pro Line Series is available at specialty retailers. The automatic sensor automatically lowers bread into the self-centring racks upon sensing bread in a slot, then lifts bread as soon as it has reached the selected shade. Keep Warm Feature initiates when toast hasn't been removed from the toaster within 45 seconds. Toast automatically lowers to keep warm, for up to three minutes. 7 Shade Settings allow you to choose precisely how light or dark you want your toast. Use with the sandwich rack for delicious toasted sandwiches. 7 shade settings to toast from light to dark. KEEP WARM FEATURE Automatically keeps toast warm, for up to 3 minutes, even when you're not there.BAGEL FUNCTION Perfect for bagels, crumpets or buns and toasts the inside without burning the outside.FROZEN FUNCTION Gently defrosts and toasts frozen bread.SANDWICH FUNCTION Use with the sandwich rack for delicious toasted sandwiches.TOAST/CANCEL FUNCTION An easy way to start or stop toasting at any point. 5 years replacement warranty against manufacturer's faults for household use. Sandwich rack and removable crumb tray. KMT2204 Toasters Candy Apple Red is rated 4.1 out of 5 by 10. Rated 4 out of 5 by MichaelaS from Beautiful toaster I love my kitchen items to match so I gravitated to buying this super expensive pro line model to match my pro line mixer. I had been eyeing it for years and took the plunge when my Breville finally died after 15 years. It roasts evenly and I love the keep warm function whilst I multi task. I was only disappointed by the lack of videos or instructions to use all features, I could not work out how to grill a toasted sandwich in it as it’s so expensive I’m not about to melt cheese all through it so still haven’t done this. 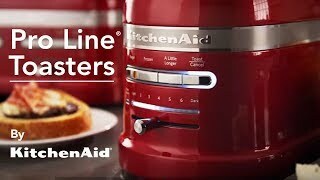 Please KitchenAid do decent demonstrations of your products online and more in depth instructions. I had the same experience with my pro line blender, for the price I am paying I expect to be given this. Rated 5 out of 5 by ROZY from GOOD QUALITY Very happy with the toaster. Very good quality. Very easy to use. Rated 3 out of 5 by toastophile from Undecided i bought this because of the Kitchenaid name, and I loved the design and colour. I have the stand mixer which is the best appliance I have ever owned for the kitchen. The toaster is very slow and needs to be turned up to setting 5 to even lightly brown the toast - although this has been on very fresh bread. I am a bit disappointed but will reserve judgement until we have used it for a few more weeks. Rated 2 out of 5 by KateQ from Looks good, toasts poorly I bought this toaster after being told it was a superior matching. Unfortunately the toast is very uneven as the element is badly wired and doesn't heat up in certain areas. Rated 5 out of 5 by Felix from Unique features Many unique features with a high quality build make this a wonder to use. Enjoying breakfast time once again!